SharePoint Online is a user-friendly and efficient than any other document management system. However, security is the main concern because it is a cloud service. It is always necessary to have limited control and access for the users. Administrators can restrict a user from downloading or printing the documents from SPO document library. Go to Site/Subsite > Site Settings > Site Permissions. 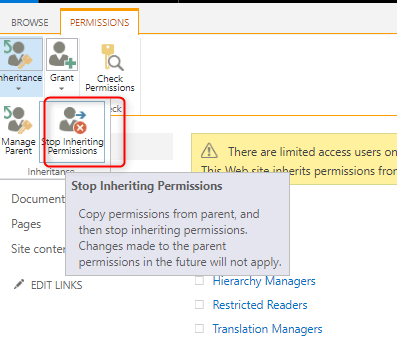 Click on Stop Inheriting Permissions. After that site will have a unique permission (see below image). Note – By doing this, the site will not inherit the same permissions as parent site. Create new groups for this site/subsite as you have assigned unique permission. You will get below the screen to create groups. In below image you can see three new groups has been created, you can add members to these groups as per your requirements. 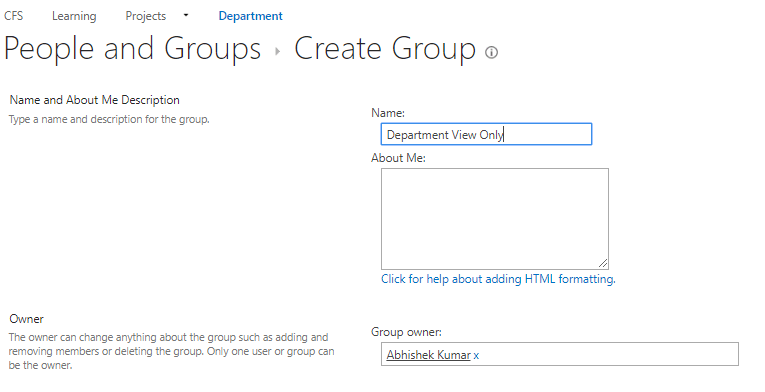 Provide the name and the permissions level (view only permissions) for this group. In below image, you can see the downloading option, when you select the document. Add users for whom you want to restrict downloading. After adding a user to View Only group, users will only be able to access the document but will not be able to download. 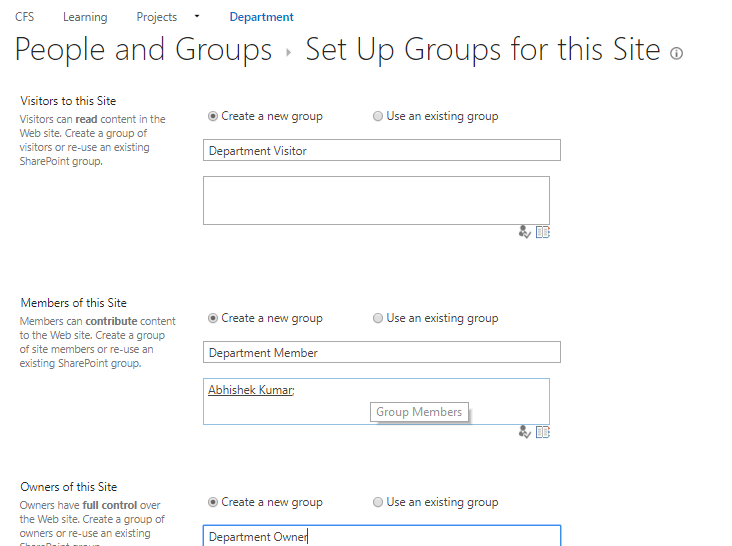 Yes, the sharing option will be available to users, but you can manage it from SPO Admin center > Sharing. 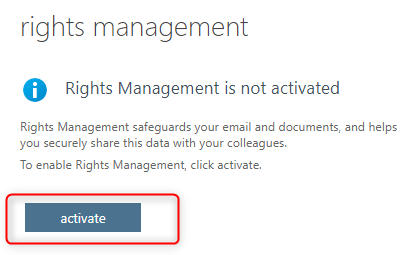 Firstly, we need to activate Rights Management from the Office 365 Admin center. 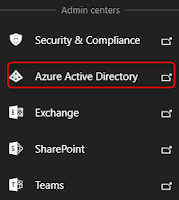 Go to Admin Center > Settings > Services & Add-ins > Microsoft Azure Information Protection.IRM – Information Rights Management is applied to files at the list or library level. IRM feature requires an Office 365 E3 subscription. Go to Site/Subsite > Document Library > Library Settings. 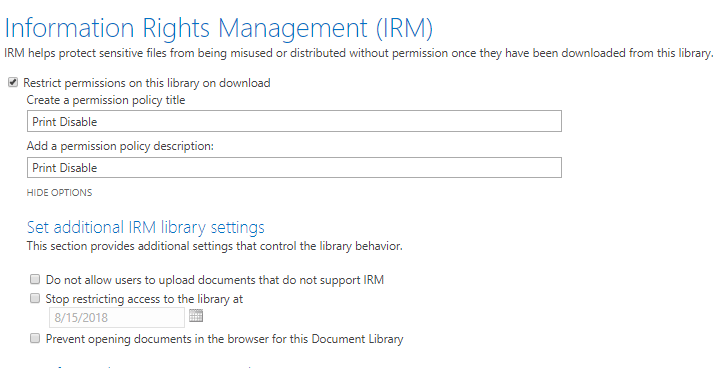 In Library settings, go to Information Rights Management. Click Restrict permissions on this library, provide the name & description. In below image, you can see, how the print option got disabled after enabling IRM for a document library. 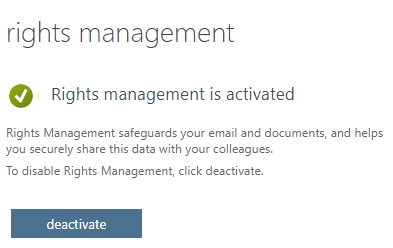 With the help of Site permissions and IRM in SharePoint Online, we can restrict users from downloading and printing the contents of a document library. This option is desired by most of the organizations considering security for the documents.